Workato’s ability to keep your data up to date in real time is a feature our customers love, but it can lead to a high transaction rate for some recipes that don’t need to run as often as others. For example, if your trigger is “ticket closed” in Intercom, Workato will scan Intercom for recently closed tickets, but if there are not tickets closed since the last transaction, the recipe will stop. Without a trigger filter, this still counts as a transaction even though it did not go through the entire workflow. Now, with Trigger filters, you can still ensure that your recipe picks up the trigger in real time without wasting a transaction when the trigger is not present! The recipe will run based on the actions you set instead of picking up every single ticket and ending the recipe. Workato gives Community users 100 transactions per month, Premium users 5000 transactions per month, Professional users 50,000 transactions per month, and Enterprise a custom transaction limit. Trigger filters will make these limits last even longer, allowing you to do more meaningful jobs without increasing your transaction limit. 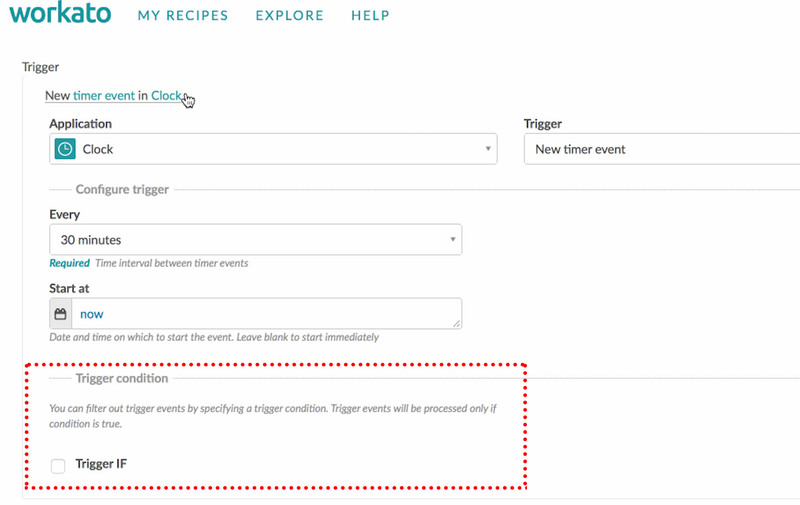 If the recipe has the option for a Trigger Condition, you can activate a trigger filter by checking the ‘Trigger IF’ box. Fill in the trigger data and start time. For some recipes where the trigger action happens less frequently, it may appear like nothing is happening because the jobs are being filtered out. For example, if there are no closed tickets for the day it will look like there are no jobs even though the recipe is running. By defining the condition for the recipe trigger, your transactions will be more efficient than ever before. Happy recipe building!